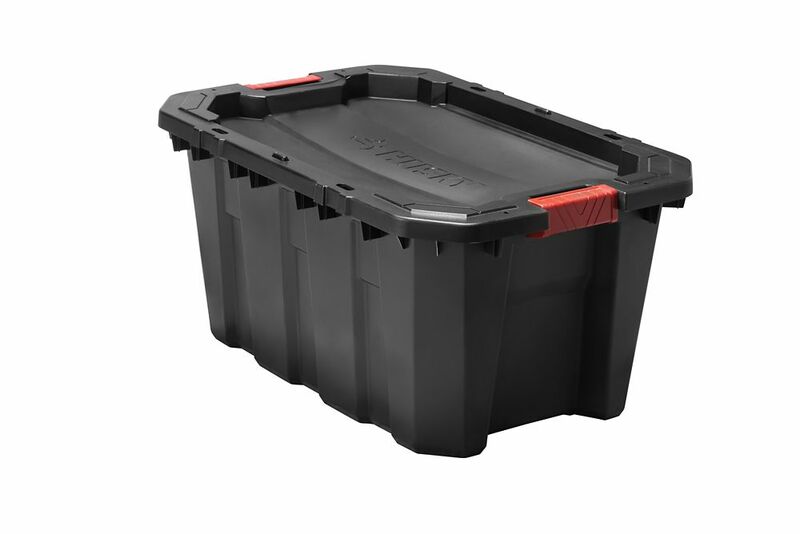 This Husky 94.6 L storage tote is designed to handle all your storage needs. Whether it's on the jobsite or around the house. The heavy duty structure allows for a secure setting while freeing up space and providing ample storage of everything from tools to toys. Heavy duty latches keep lid securely in place to insure items remain safely inside. 94.6L Latch & Stack Tote This Husky 94.6 L storage tote is designed to handle all your storage needs. Whether it's on the jobsite or around the house. The heavy duty structure allows for a secure setting while freeing up space and providing ample storage of everything from tools to toys. Heavy duty latches keep lid securely in place to insure items remain safely inside. 94.6L Latch & Stack Tote is rated 5.0 out of 5 by 1.